Should I Take A Pregnancy Test At Night or Morning? Home Pregnancy Tests Pregnancy Test FAQs Pregnancy Test At Night Or Morning? Pregnancy Test At Night Or Morning? Should I Take A Pregnancy Test At Night or Morning? Taking pregnancy test at morning goes beyond just – That’s the way people do it. There is a scientific reason behind it. And we will tell you about the actual reason and also how you can take a pregnancy test at night or morning! When should I take Pregnancy Test At Night or Morning? Can you take the pregnancy test at night? Is pregnancy test at night accurate? A pregnancy test at night or morning is not about the position of the sun! You can take a pregnancy test at any time of the day. All you need is enough hCG in urine for matching the sensitivity of pregnancy test. Pregnancy tests detect the hormone hCG present in pregnant woman’s urine. This hormone doubles every 48 hours. Some women might take longer to reach the hCG levels of pregnancy tests. Early pregnancy tests can detect lower levels of hCG. A good pregnancy test can detect pregnancy at any time of the day after three weeks from conception. Home pregnancy tests have different sensitivities. Some can detect a low level of hCG up to 20 mIU/mL. But this will only be a prediction of expected pregnancy. When a woman has urine hCG level of 25 mIU/mL and above, then she is pregnant. Taking pregnancy test at morning is preferable because the early morning urine has a higher concentration of hCG. Overnight the urine concentration rises, and hCG levels rise along. It is like the water reducing from sugar syrup. The lesser water, the better the detection of sweetness. Taking pregnancy test at night will be similar if you have not been to the bathroom for 6 hours or so. The point is only that the urine hCG levels should be enough for the pregnancy test to detect them. Women might find it hard to wait for taking the pregnancy test if they don’t know the reason. A dilute urine sample can give you a false negative pregnancy test. It means that despite being pregnant, you’ll get a negative pregnancy test. Taking pregnancy test at morning ensures that you will have enough hCG. The hCG hormone reacts with the pregnancy test dye and gives it color. The colored line is the pregnancy test line. A pregnancy test line confirms a pregnancy. When you take a pregnancy test at morning the chances of getting a big fat positive are increases. A big fat positive pregnancy test is a clear test line which confirms a home pregnancy test. Best time to take the pregnancy test is morning. If a woman lacks patience, she might find it hard to wait for the entire night. When you are taking a pregnancy test to detect an unwanted pregnancy, it is difficult to be patient. In this anxiety, one might want to take the pregnancy test at night. But this does more harm than lying sleepless for one night. It is better to bear a night filled with stress than get a false negative pregnancy test. Similarly when a woman is undergoing infertility therapy, then she might want quick results. But taking the pregnancy test too early cannot detect pregnancy. Any pregnancy test cannot detect pregnancy unless hCG level is sufficient. This is why it is best to wait until morning. Nonetheless, it is not impossible to take the pregnancy test at night. If you have passed two weeks from missed period, then you can surely take the pregnancy test at any time of the day. It is better to use a pregnancy test when you have not been to urinate for about 3-5 hours at least. Early pregnancy test needs to be early morning. If you get up during the night to go to urinate, then your early morning pregnancy test will not be as accurate. If you get up during early morning hours, then take a pregnancy test at that time. You can take the pregnancy test at night. Taking pregnancy test at any random hour of the day is worse. When you decide to take a pregnancy test at night, you need to make sure that you’ve passed enough number of days from missed period. Another way of taking the pregnancy test at night is to store early morning urine. If you have to go to work and can’t take the test correctly at morning, then you can store urine. A 24-hour urine sample is good for taking a pregnancy test. After that urine composition changes and it is no longer suitable for carrying out the home pregnancy test. You can store urine for the pregnancy test at night. Take a clean bottle and collect early morning urine sample. Keep it in the refrigerator. Do not expose it to sunlight. Exposure to sunlight can decompose the urine and make it unsuitable for taking a pregnancy test. Women might have a concern regarding keeping the urine in the refrigerator. You can cover the bottle with a plastic bag. Keeping the urine sample outside is going to affect the quality of urine. A false positive pregnancy test is very rare. Even at night, one needs not to worry about the false positive pregnancy test. Only women taking certain fertility drugs get false positive pregnancy test frequently. Otherwise, it occurs rarely. A false negative pregnancy test is common. When a woman takes a pregnancy test at night she can never be sure whether the test is accurate. A doubt about the accuracy of pregnancy test at night always lingers in her mind. It is best to avoid such confusing results and take the pregnancy test at morning. 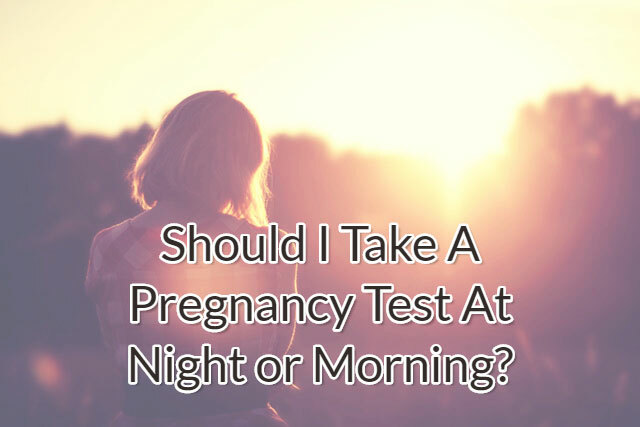 Read more: Can I take pregnancy test at night? If you want accurate pregnancy test at night, then wait for at least a missed period. Doctors say that it is not suitable to take the pregnancy test on the day of missed period. This is because the day of missed period coincides with implantation. During implantation, the placenta formation just begins. Until there is placenta hCG levels will be low. The placenta takes time to produce enough hCG. It is best to wait for a week after the missed period to take the pregnancy test at night or morning.